Confession: I don’t get excited about beverages unless they have an alcohol content. There, I said it. I’m sure I’m not alone. But, it is what it is. Sweet tea, fruity flavored lemonade, they just don’t do it for me. Except maybe orange soda. I once had a sweet spot for that, and perhaps still do, but haven’t had it in years. And dare I say it: serving non-alcoholic beverages is always kind of an afterthought. “Hey, we forgot to get some soda, who can we call to pick some up on the way?” Oops. But there’s some good news. Us boozebags don’t get to have all the fun anymore when it comes to pairing interesting libations with good nosh. Which is absolutely fair, given that, for a variety of reasons, not everyone chooses to drink alcohol. Or caffeine, or artificial flavors and colors, for that matter. Which is why the good folks at Cascal have come up with a line of handcrafted beverages geared towards adults who appreciate good taste without all the crap. Or next-day consequences. 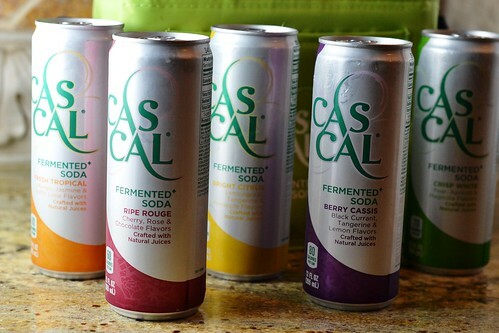 Cascal is not your average soda, no way. It’s distinguished by a light, yet complex fruity taste and perfect amount of fizz that comes from a natural fermentation process in a micro-brewery. And it comes in these tall, skinny cans that somehow manage to make you feel sophisticated. I don’t know why, but they do. When drinking blends like Fine Dry (with notes of apple and anise) and Light Red (with notes of black current and mirabelle), you might wonder why no one’s asking for ID. 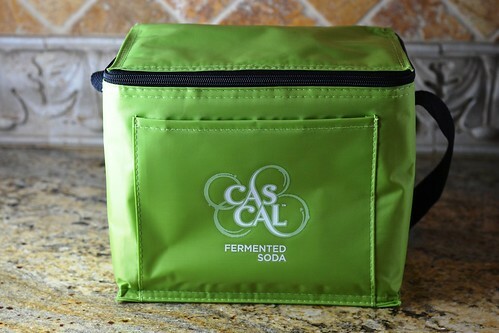 In case it’s not clear by now, I received a lunch tote filled with Cascal flavors to try out. And rather than just drink them and report back, I thought it would be more fun to choose a few of the flavors and come up with a fun little Cascal tasting menu, pairing the each soda with a recipe meant to compliment its unique flavor. First up was the Crisp White. With a flavor profile containing pear, apricot and magnolia, I might liken it to a dryer riesling. It could go nicely with a cheese course, for sure, but I came up with an east-meets-west rangoon filled with other flavors I thought would match nicely: salmon, apples, and ginger. This was my favorite flavor and recipe of the night, which is why I’ve chosen to share it below. I love that the soda is not “in-your-face” syrupy-sweet, and has a few layers of delicate flavor, just like a good wine. It went particularly well with the ingredients in my salmon rangoon, each helping to bring out the different notes in the other. Next, we went with the Fresh Tropical flavor. Remember my sweet spot for orange soda? This reminded me of that, but with a much more interesting adult flavor. You know, more than just sugar. The description on the can (other side) suggested pairing it with barbecue, so I picked up some brisket from the local bbq joint and made sliders. Yes, she did. There was more effort meant to go into this course than you see here, but I, uh, forgot about the oven for a little bit. Thus, that accompaniment didn’t make it onto the plate. Fortunately, we still really enjoyed this pairing. Lastly, we paired the Ripe Rouge – with notes of cherry, rose, and chocolate – with a fudgey chocolate cake laced with cinnamon and finished with a caramel buttercream. Sort of. I mean, you guys know me. It wasn’t just your average sugary, gluten-ous cake and frosting. There were quinoa and dates and cashews involved, and it was quite lovely, but I’m going to wait and share it another time. The Ripe Rouge blend was a nice match, providing a little extra oomph than any berry-flavored soda I’ve tried. The fact that its a bit closer to a wine than a sweet drink made it a great compliment to dessert, not overpowering. To enter the giveaway, simply leave a comment telling me which Cascal Blend you’d most like to try, and if you’re feeling extra creative, what you’d pair it with. Can you do other things like stumble this post, share it on twitter, or like Cara’s Cravings or Cascal on Facebook? Of course you can, but this time they won’t be for extra entries. If you like this post and feel inclined, however, I’ll take it as a compliment. The giveaway will be open until Wednesday, October 5th at noon (EST) at which point I will choose 5 winners at random. Cheers! 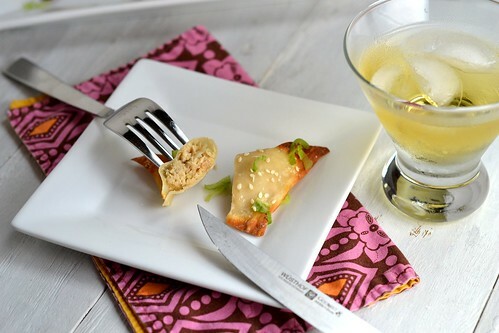 These tasty little bites are such a fun, seasonal twist on the classic crab rangoon appetizer. I was a little worried that the sweet-tart apple and fresh ginger would overpower the goat cheese, but everything worked together wonderfully. They’re just as easy as the original too. Preheat oven to 400ºF. Place a metal cooking rack on top of a cookie sheet. Place the goat cheese and salmon in a medium bowl. Peel the apple and grate the apple using the large holes of a box grater, and squeeze out the excess liquid. Add the apples to the bowl along with the ginger and sesame oil. Mix well and season to taste with black pepper. Working with a few at a time, place wonton wrappers on work surface and brush the edges of each one lightly with water. Place a heaping teaspoon of filling on each one, and pinch the edges closed. Arrange the filled wontons on the baking sheet. Spray them lightly with cooking spray, then flip them over and spray the other sides. Sprinkle with sesame seeds. Bake for 15 minutes, or until lightly browned and crisp. Serve hot with soy sauce for dipping. I cant wait to try Ripe Rogue!! 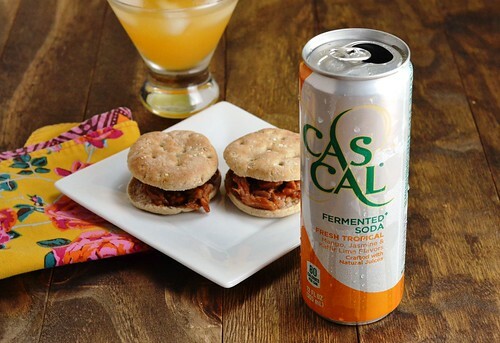 I love this idea… I haven;'t had any CasCal before but I think that Tropical Fresh sounds wonderful! Berry Cassis with Lemon Meringue pie!! Fresh Tropical and some fish tacos! The ripe rouge sounds really good to me! I'd love to try the Fresh Tropical flavor. I can't imagine much other than a Shiner or an ice cold Big Red as the perfect pair with barbecue, but I'm willing to give it a shot! Those rangoons sound fantastic. Obviously I am a goat cheese fan so I love the sound of using it in a more Asian-inspired application. Dry White! And I'd pair it with the Thai takeout I'm about to order . . .
i would be most excited for the citrus and the cherry. but can i tell you that i love adult soda more than life itself? i am one of those non-alcohol drinkers (although i have just started trying wines) and i get so sick of the only option being sugary drinks. i really love dry sodas. my favorite is GUS (grown up soda), i have never heard of cascal. but also these salmon rangoons sound wonderful. The Fresh Tropical sounds the best which I am not sure what I would pair with it. But if I had the Ripe Rouge, I would pair that with my black forest cupcakes. Even though I am not a huge cherry fan. Crisp white and chinese takeout when hubby and I have at home date nite. I used to be a HUGE diet soda drinker but now I've turned to seltzer in my old age. Not such a big drinker these days…but if something is interesting I can get excited about it. 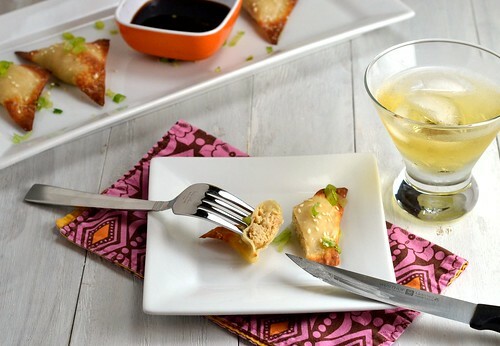 I AM excited about these salmon rangoon! Way better than crab. The Crisp White sounds great! And I can't wait to try your Salmon recipe. It sounds amazing! I would love to try the crisp white. It sounds so light and refreshing! They all sound amazing! But if I have to pick, I say the crisp white! They all sound good, but the Crisp White stands out to me the most. I think I'd like to pair it with French onion soup or something cheesy. Make mine a honey and malt to go with a blue cheese burger and sweet potato fries. Mmmmm…. I'd love to try the Crisp Wine! oh man, i love the sounds of these!!! ripe rouge would probably be first 🙂 but everything sounds good and those rangoons, awesome! The Ripe Rouge sounds delicious. i'd like to try apple/anise! yum! The ripe rouge sounds good. I'd love to try the Crisp White in my pasta with four cheeses and pear saute in cream. I'd love to try the Crisp White version! I'm allergic to beer so this might be a nice hot-weather alternative! Thanks for the giveaway! The light red sounds tasty! I'd love to try the cherry, chocolate, rose! For fairly apparent reasons I've gotten really into specialty non-alcoholic drinks of late. That crisp white sounds totally up my ally! I love crisp, clean, mildly "exotic" or spicy flavors. Yummy! And knowing my love for cheese, I'd pair it with a stilton that's packed with dried fruit. Mmm! 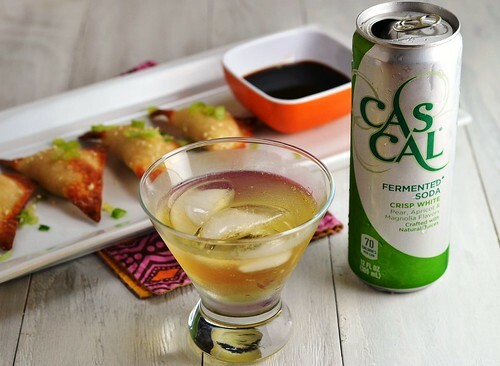 I would love to try the Crisp White… this is so great for people who have reasons to drink less alcohol but would still enjoy having an interesting drink! Fresh Tropical with fish tacos! 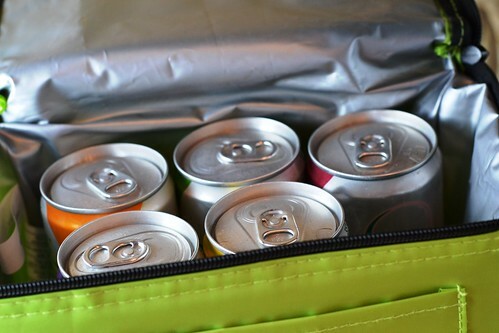 I hadn't heard of these sodas before, but I'm a recovering soda-addict, so they sound fantastic! The "crisp white" particularly caught my attention. I like orange soda too and would go for the Fresh Tropical – and probably pair it with some booze, haha :)Love your apps too – I was sold at the goat cheese! would love to try the crisp white with a black bean chili! Oh, the Crisp White looks great! I think you're onto something with the salmon pairing, I'd like to try it with a spicy teriyaki grilled salmon! I'd pair the Ripe Rouge with Chocolate Caramel Sea Salt Cookies! Crisp White sounds delicious and I am def trying your wonton recipe. Mmm…I would pair the Ripe Rouge with a classic cheesecake, instead of a fruit filling! I'd love to try the crisp white. What a fun pairing! I want to try the crisp white!!! Those look delicious.And have I ever told you that crab rangoons are my favorite bad-for-you food. And now you made me a healthy version- this is why I love you so much! ripe rouge? sounds like red wine-ish, and i've been craving some but am nursing a newborn! this sounds amazing!! Ripe Rouge sounds the most interesting to me. 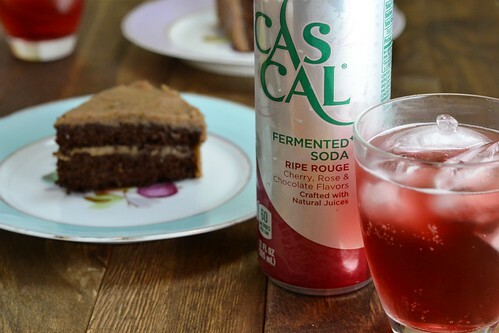 Yum these sound SO good, I love the idea of more sophisticated soda drinks. The Ripe Rouge sounds especially delicious!